Announcement Thank you for visiting my little shop! We have a very reduced inventory right now, as we're getting ready for two Comic Cons!!! If you're in Salt Lake City Utah, visit our booth at FanX on April 19-20 or in Phoenix Arizona at Fan Fusion on May 23-26. Of course, you can always request a custom order. We'd be happy to work with you! Thank you for visiting my little shop! We have a very reduced inventory right now, as we're getting ready for two Comic Cons!!! If you're in Salt Lake City Utah, visit our booth at FanX on April 19-20 or in Phoenix Arizona at Fan Fusion on May 23-26. Great, fun bags! The girls love them. Well made! Great blanket, girlfriend loved the gift!! Just the cutest little bib. Can’t wait to give it as a gift. Extra large throws approximately 54"x63" are perfect from birth to adult. I Love Anything Sci-Fi, Fantasy and Superhero and I Love to Sew! Mom, Na-na, wife, sister, friend. Just a few of my titles. I work by day and sew by night. My superpower is stating-the-obvious, but I really wish it was healing people. I love Star Trek, reading, growing vegetables, and working with children and of course crafting and sewing. Magic and Magic Moments has been in my family for a very long time. I love to share a few magic moments where ever I go. When I married and had children, during the time of the rise of Bill Gates, Steve Jobs, Magic Johnson and Michael Jordan, I always told my children, it's better to be a geek/nerd than an athlete. Bill Gates is worth way more money than Michael Jordan. And to my delight, my children listened. Our home was and still is full of Magical Things: dragons, unicorns, mermaids, dinosaurs, elves, dwarfs, giants, Disney, Star Trek, Star Wars, Zelda. LOTR, Ninetendo and so many more! With that love and 40 years of sewing experience, I started sewing blankets for my grandchildren with all these magical characters. (What better way to spread joy or help someone heal than a home-crafted blanket?) It was an easy move to become a vendor at our local Comic-Con and beyond. About 10 years ago, as an owner of a different Magic Moments, I became very concerned with the waste we produce at home and in business. It is that concern that has led me to produce eco-friendly, reusable products, but with a Magical Fandom Twist. Life is hard, so why not enjoy Magical Moments through books, movies and games, blankets, bags and save the planet while we're at it! To fulfill your order, you must provide me with certain information (which you authorized Etsy to provide to me), such as your name, email address, postal address, payment information, and the details of the product that you’re ordering. You may also choose to provide me with additional personal information (for a personalized embroidery, for example), if you contact me directly. I take returns on a limited basis for any damage that occurred while I am making the product. I do not take returns for custom orders or personalization, including incorrect spelling. A custom order or personalization becomes nearly impossible for me to resell. I do not return for orientation of pattern on the blankets and products, and slight variations of pattern placing from the pictures. When a personalization is selected, I do send a convo/email verifying the spelling of the name and font and colors. Please make sure you have the correct spelling and check email to make sure I have the checked spelling correct. I carefully design the personalization on your notes to seller and will not accept returns. Please note that I ship directly to the address that comes through with the order. If the item gets returned to me due to incorrect address or for any issues with the post office, there will be an additional shipping fee for me to resend it. Thanks in advance for double checking the address when the order is submitted. What if I don't see a fandom or color in a product I would like to purchase? 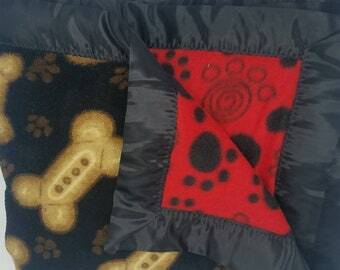 I can make custom orders on all products, from blankets to wet bags and un-paper towels. If you prefer a particular color or pattern or fandom, if I can find the materials, I'm very happy to make a custom order. Completion times vary per product and can take from 5 -7 business days. The times vary during the year and season. Typical custom orders are taking 5 - 7 days, as of October 18, 2018. 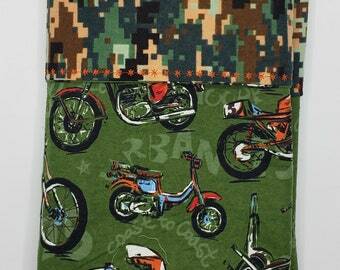 Of course, that time can be longer if obtaining the fabric is delayed from the supplier. I will communicate any delays beyond these times. Personalized embroidery on "Ready to Ship" items can take 2 -3 business days to complete beyond the individual shipping times in the listings. These times are the times to deliver to the post office. Beyond that point, I have no control over the mail delivery system. Average time once they're at the USPS is about 3 -5 days within the US, depending on where in the country you are located. Yes! I am very happy to monogram a blanket or pillowcase with a personalized name for just $5.00 (up to 7 letters.) If you would like a name longer than 7 letters, please convo me. In some cases I can do longer names. You can find products that can be personalized by looking for the "w/Personalized Name" option. 4. Would you like the name on the corner or along the long edge side. Monogramming will not be completed unless the "Personalized Name" option is chosen. All products can be washed and dried, including our eco-friendly products. 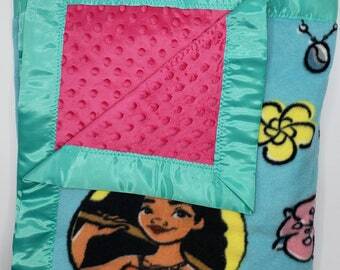 All but the minky and fleece blankets are 100% cotton and may shrink a small amount. Flannel Blankets: Wash Cold, Dry Medium, Iron with steam on cotton setting. 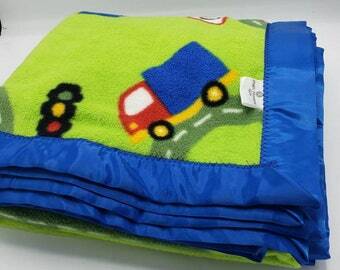 Minky/Fleece Blankets: Wash Cold, Dry Medium. Do not iron minky or fleece. Flannel/Minky Blankets: Wash Cold, Dry Medium. Only iron on the flannel side. Do not iron minky. Pillowcase: Wash Cold, Dry Medium, Iron as needed. Snack Bags: Turn inside out and Wash, warm water (although I do use hot) do not use fabric softener. Dry, medium heat. Do NOT iron the Food Safe PUL. You can do a light setting on the outer cotton. Do you pre-wash your materials? I do not pre-wash any materials before sewing. I'm the half of the sewing population that loves the feel and look of products made with un-washed material.